Have any of you tried the Nike Sportband? I’ve been tracking my runs using Runningmap.com and it’s worked out well to give me an approximation of my kilometres except that I want to know precisely what my kilometres are as well as my pace (which I’m pretty good at approximating too) and elevation so that I can start tracking my runs in terms of distance and not time spent. I also need something with a stopwatch function. The Nike Sportband retails here in Canada for $79 but were going on another US shopping trip soon and it’s $59 over there. Or I can get a Garmin 110 for $199 like a reader suggested to me. I think I’m also being swayed by the nice sleek packaging and pretty colors. And also the fact that it’s pretty simple, all you have to do is plug the USB portion into your computer and it uploads your workout without the need to have an iPod (my iTouch is too old for the Nike+). I know eventually I’m going to want the Garmin but for now, can I make do with the Nike sportband? If you have one of these doohickeys please let me know if your happy with it. "Yay, Running Gloves (Brisk Running Gloves)"
I have one. So does my husband. I <3 it, but it's not necessarily the most accurate with mileage. You have to calibrate it when you first get it but honestly I don't think this made any difference for me. I have a very short stride. I used it for a half marathon (13.1 miles)…started it right when I crossed the start line and stopped it right at the finish line and it said I ran 15.76 miles. Not accurate at all. Which throws off the pace time that it shows. They only way I can use it now is to know that I have to run 1.2 before I know I have ran a mile. I do however like it because I always know what my total time running is. And I wear the thing ALL the time as a watch. So I love the sporty look of it. I also wear it playing basketball sometimes, and the main part of the watch (the part that detaches and plugs into the computer) has come out twice while playing. Luckily it hasn't gotten stomped on yet! About the nikeplus.com website. It's not always responsive. Sometimes I have to unplug and replug the thing back in several times before getting it to register that I'm trying to upload my data. I must say, if you can get yours to calibrate correctly and know that your mileage is accurate, it's a very useful tool. However, since it assumes everyone's stride is the same length, you may have issues if you have either an extra short or extra long stride. The first one that my husband bought died for no reason after 3 weeks. We exchanged it at the Nike store and he hasn't had issues with the news. No idea why it happened. In summary, you get what you pay for. If you're looking for accuracy and do a lot of running, I'd spring for something a bit more expensive (Garmin?). 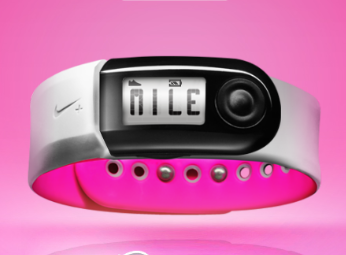 If you're looking for a sporty watch and just want a gadget for a fun run, the Nike sportband is for you. Friends that I run with have the Garmin and swear by them. Pricey but worth it they say! If you plan to keep on running invest in a garmin. I started using one of their 100 series years ago and last year I upgraded to there 405 model. I am in love with Garmin as much as I am in love with Lulu, LOL! Invest in a garmin you won't regret it. Go with the Garmin! My darling hubby got a great deal on a 405CX from a US-based company for me. Get it shipped to you in Seattle or something. LOVE it!! I use a garmin for my longer more "serious" runs but for everyday runs I use the little nike chip that you put on your shoe and then plug into your iPod. I like having the feedback each time I complete a km and once complete it will estimate my pace etc. Also lets me plug it into my computer and see my pace over the entire run so I can tell where I slowed down, where I may have sped up to much, etc. I have found it really accurate for such low grade technology… I ran with the chip and my garmin once and they only differed by a few hundred meters. I did have a sport band at one time but I found it very iffy and sometimes during runs it would stop working or miscount which I found really frustrating. It also chewed up batteries like crazy and it got to be pricey to constantly replace them. So my chip and my $10 stopwatch from Zellers do just fine. I think I've decided to hold out for the Garmin for Christmas. The Nike sport watch doesn't look like it has a stop watch option which I like for my 10/1's and I can probably make do without either until Christmas…I guess. Thanks all very much for your input. I would definitely hold out for the Garmin! I have a Garmin 305 that I got here in Ontario at Costco. I think it was $169 – worth every penny. Very user-friendly and gives you everything you need to know about your runs, ie. distance, pace, calories burned, heart rate, and a lot more! Although it seems like there is general consensus, I just wanted to add that all the feedback I've heard about the Nike (while working at the running store) is exactly what M mentioned in the first post. They seem to severely be lacking when it comes to accuracy. I think calibrating helps but has to be done quite often. I like the look too…but I had a friend who seriously thought she was running 9min miles when she was at 10+. That has to be quite disappointing. How is your Ipod touch too old to use the nike+ system? I have a first generation Ipod NANO and it works just fine with it…? I love my nike +, I calibrated it twice with a person who has the Garmin and now its dead on accurate everytime, I run 3 times a week with others who have garmins and our distances are always withing 0.01 km at the end. Im really pleased with it, the ease of use, and nice design and glad I didnt spend the $$$ on the much larger Garmin.